Most of the old-school car factory installed with analog voltmeter. But most of the modern car nowadays does not equipped with this vital tool. So we need to install it by sending our car to the experts or drive directly to the car accessories because most of the car accessories sell this device. What is the important of the volt meter? 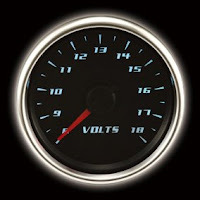 Some automotive enthusiasts just display volt meter as accessories or gadget for a different views of their dashboard. But actually this extra gadget is very important to tell driver about the electrical system circulating in your car is in good condition or otherwise. Generally volt meter will refer to the voltage output from the alternator and battery. Here are the explanation. If the reading of the voltmeter while engine running is below 13.0v, mean that you must send your car to the expert as soon as possible. Because why, if your alternator reading is below 13volt, and it decrease to 12, 11 and 10volt, mean that the alternator cannot produce electricity for your car, and when your car need more voltage, but the alternator fail to generate it, of course your car will be loosing power . When voltage drop again to 10, 9 and 8volt, all the accessories will be malfunction and then the engine will be stop working and you will be stranded. Why this happen? If alternator malfunctions, the voltage output will be drop slowly until it reaches the battery voltage. At this time, engine and other electronic accessories will use the battery power to make it running as usual until the battery power drained because the alternators fail to recharge the battery. The highlight here is; when the reading of the volt meter drop below 13.0volt, and it continuously drop again, better you find workshop or save area to park as soon as possible. Otherwise, you will need to pay a lot of money to tow your car to workshop instead of paying for spare part and labor cost only. 2. Reading taken for battery voltage output. But, if the reading of the voltmeter drop below 12volt after one or two days, mean that the battery need to be replaced with new one because of the battery voltage leaking. Get ready with your budget next month!! (make sure there was no electronic accessories such as in car entertainment system, room lamp, and all the bulb outside still ON while engine OFF"
See, how this gadget can save your money and time. Without volt meter, you cannot early detect the sign of battery the alternator malfunction. When you can detect as early as you can the problem of your car, you can ready with the budget and find some space for you to send your car to workshop. The volt meter reading is very accurate if connected directly to the positive and negative terminal. So find the volt meter that can connect directly to battery terminal and you can read it while you are driving. My suggestion is that you buy volt meter that can be displayed somewhere on your dashboard, connect directly to the negative and batery terminal BUT USE RELAY to make it (voltmeter) OFF also when you take off your car key from ignition. Otherwise, if you are not using relay and connect directly to the battery negative and positive terminal, the chances of the voltmeter draining the battery is there because the voltmeter will ON 24hours and will shorten its live. Different with voltage stabilizer that build in with meter, this type of prouduct was design to operate 24hours without draining you car battery eventhough connect directly to batery terminal. But most of the aftermarket voltage stabilizer will be installed somewhere in the engine bay, and you cannot read it while driving. Voltage stabilizer also can impove the voltage stablility of you car and increase the battery life. Make sure to buy the original one. What is a voltmeter, It is an instrument used to measure and test voltage between two points in a electrical circuit. Test with accuracy with our selection of volt meters. Visit our online shop now. It's true that today it is rear to find volt meter in car. Today every car is fully automatic that's why company does not use volt meter in car. It must be recognized that volt meter is truly an important parts of the car. So now some company provide extra volt meter for cars. Hi Bro, this really amazing site, i have read through all your post from 2014 until this and decide to drop you a comment here. Firstly thank you for all information you sharing here, really good. I'm driving a carburetor engine with original one, not as you lastly turn become turbo, haha. My current car is Proton LMST 1.3MT, i', thinking to install a oil temp gauge and oil pressure gauge, because it can be done to install a oil filter adapter, then i can place both sensor there. My car ori water temp is not accurate, especially when head light ON, after check online there was a common issues for LMST. So think to install aftermarket water temp gauge, but after read through site, oil temp meter will be more suitable for me, just add on a oil filter adapter. I have few question for this 2 gauge installation. 1. Does the oil filter adapter need to install during engine oil change? Because remove the oil filter will cause the engine oil leak. 2. Does the oil filter adapter will easily cause leak? I don't want because of the gauge sensor installation cause other issues. 3. Normally how much the labour charge for oil temp and oil pressure gauge installation? If i purchase the gauge myself. Alternators typically do not fail gradually, they simply stop. The decreasing volt reading happens when the battery is discharging after the alternator stops working, at which point the alt light would come on anyhow (in most cars). The voltmeter does nothing to help you with battery health. which is the most common cause of no-start. Even if the battery is not holding or building charge, the alt output will stay at 12-14v. You battery may barely be able to start the car one time, and if you park with the lights on for a short time, you may be stranded. What cars need is a good cheap lead-acid battery health monitor. A display will certainly turn up revealing the search bar. iTunes Store Login Customers need to download and install the whole application with each tiny upgrade. I hope that more and more people will start reading your blog. I really looking for such article. By Jiken Bill@kent1189. Powered by Blogger.